One of the last industries you think of for promoting sustainability is the sports world. Players and fans flying and driving all over to attend games in large air-conditioned venues with lots of lights, huge amounts of concession stand food in disposeable containers. One team is stepping out and taking the lead towards sustainability, the Philadelphia Eagles of the National Football League (NFL). The Go Green! initiative focuses around some key initiatives: renewable energy, energy efficiency and conservation, recycling and waste reduction, reforestation (tree planting), and procurement decisions. To start with, the Eagles offset their carbon emissions for the 2010 season through the GoZero program, which is managed by the Conservation Fund organization. They had been working their way up to 100% offset over the years. In 2009, the Eagles ran 100% of their operations on wind and solar, a small portion of which comes from their solar array at the NovaCare Complex, which produced 12,757 kilowatt-hours (kWh). In addition, they have cut their stadium’s annual electricity use by nearly 50% since 2004 through energy conservation and efficiency improvements. The Eagles also created the country’s first Renewable Energy Employee Benefit Program, which encourages all full-time Eagles employees to purchase renewable energy credits (REC’s) from Delaware Valley region energy. The program compensates employees by paying the difference in price between current and renewable energy. In 2009, more than half of the organization’s eligible employees took advantage of this program. In 2008 and 2009, the Eagles offset 100% of the greenhouse gas generated by team travel (air, bus, train and hotel) through tree planting. Their tree planting efforts take place at Eagles Forest, a 6.5-acre site at Neshaminy State Park in Bensalem, Bucks County, Pennsylvania. 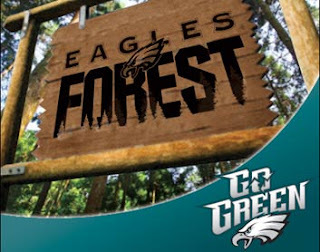 It contains more than 4,000 trees and shrubs, including over 150 trees that have been purchased by Eagles fans. They are also sponsoring tree plantings in Louisiana’s Lake Ophelia National Wildlife Refuge in Marksville, Louisiana, and helping with restoration projects in that area due to the recent oil spill in the gulf. In 2009, they launched a composting program, in conjunction with their cafeteria service provider. They capture unwanted and disposed of food, and utilize compostable or post-consumer recycled content for utensils, plates and cups. In addition, the cooking oil is sent out for conversion to bio-diesel. They are also using environmentally preferable cleaning products to clean the food service and facilities areas. Along with a strong recycling program that has been in-place since 2003, they are getting very close to achieving a zero-waste operation. In the office area, they have also made strides in reducing paper usage. They reduced newsletter publications by 36 tons of paper by moving more of the publications to online. They also moved to a digital media guide, saving more than 200 trees. They also increased the post-consumer content of the following items: game day programs, office printer paper, business cards, memo pads, invoices, staff handbooks, stadium credentials, facial tissue, hand towels, toilet paper, stadium maps, event staff birthday cards, tickets, cardstock and certain envelopes. The efforts continue with the cheerleaders. The 2010-2011 Eagle Cheerleaders calendar was the first in the league to be printed on post-consumer recycled paper. The 38 cheerleaders are wearing eco-friendly bikinis made from organic cotton or recycled plastic bottles, with accessories (earrings, necklaces and bracelets) made from recycled materials such as CD’s and computer chips. Additionally, 10% of the calendar sales will go to the Gulf Restoration Network to help protect and restore the natural resources of the Gulf for future generations. Finally, one of the key activities that got the effort moving was the Carbon Neutral game, which took place in 2005 between the St. Louis Rams and the Eagles. The teams worked with Natural Resources Defense Council (NRDC), StopGlobalWarming.org, and NativeEnergy to offset the energy usage for a single game. They agreed to use clean energy from a Native American wind project in the Midwest, and energy from a Pennsylvania dairy farm methane project. They determined that a single game produced 58 tons of carbon dioxide (CO2) pollution. The majority of the energy during the game came from heating the dome (wintertime in St. Louis), and running the huge lights during the game. However, fans, media, and teams traveling by air, bus, and car to the game had a much greater impact. They estimated that travel took up more than 10,900 tons of CO2 – about 99% of the event’s total carbon footprint. Hats off the Eagles, and especially Christina Lurie, for her drive and determination to make this happen! I hope that other teams pay attention, and start competing with them in their sustainability efforts, not just on the football field.